If you have unaesthetic tree stumps in your backyard creating an eyesore, getting in the way or playing home to termites and other pests, Call Bradshaw Tree Services in Sydney! We use the latest technology machines to remove any size stump, whether you want it ground down and chipped or physically dug out. If you already used our services to cut down a tree or clear some land, the stump grinding is included in our quote. However, if you have an existing stump that you would like to get rid of, then definitely read this article. In most cases, stump grinding is the better choice when it comes to removing the stump. While excavation totally the root structure, it is often expensive and very time-consuming and requires special machines to dig out the roots. On the other hand, stump grinding removes the visible part of the stump to just below the ground level, reducing the wood to a chip that later can be used for mulch for filling in the resulting hole or for your garden decoration. Stump grinding services provided by Bradshaw Tree Services in Sydney don’t involve the use of a digger or any chemicals to break down underground roots remaining. It’s usually a lot faster, safer, easier and affordable. Unfortunately, if termites are your concern, it may be better for your backyard to excavate as much of the remaining root system as possible. Find out more about Bradshaw Tree Services stump grinding offer. 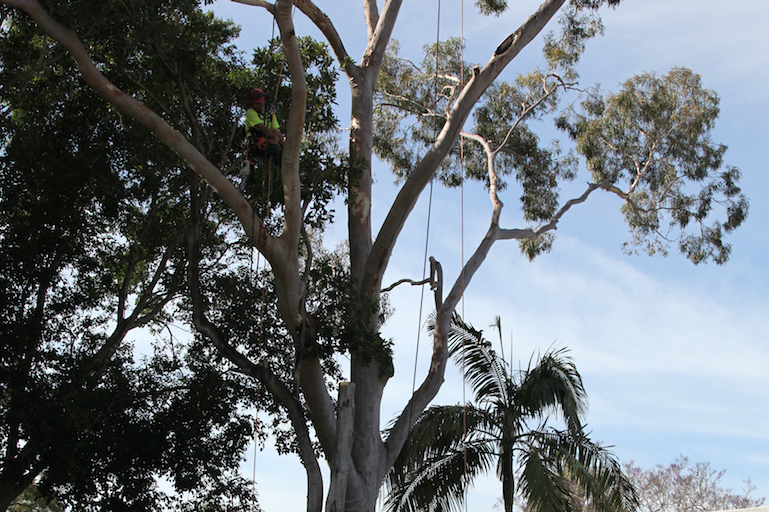 To discuss the best course of action for your situation, contact Bradshaw Tree Services for a free quote.